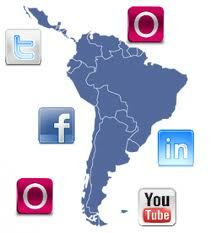 Latin America Social Media - really "Media Social"
Latin Americans are more than social, they’re ‘media social’! 2011 was a remarkable year for the proliferation of social media throughout Latin America, and that makes sense if you think about it. First, Latin America’s infrastructure doesn’t offer freedom and flexibility to move at the efficient levels we are accustomed to in the US and Europe. Second, the average Latin American has twice the number of friends and family than the average American, so social media becomes an effective vehicle for mass-communication. Therefore, Latin America social media adoption rates are accelerating. A 2011 ComScore, Inc. report showcased highlights of digital trends in Latin America including how businesses could benefit from this wave. Latin America Digital Future in Focus, examined how social media, online video, digital advertising, mobile and search are influencing the economy and how business, advertising and brand building are evolving because of these new marketing channels. Latin America's online population rose 15% to almost 130 million visitors in 2011…this was the largest growth of any region in the world. Facebook absorbed 1/4 of all time spent online in Latin America. Google was the number one site, amassing almost 125 million visitors in 2011. Social networking experienced an almost 10% increase in time, accounting for 30% of total time on internet. Latin America contains five of the top social networking countries on the planet. Entertainment sites grew 14 percent to reach almost all online users in the region. Online video viewing grew by double digits across Brazil, Mexico, Argentina and Chile. Comparison shopping accounted for the most online visits. Total soared 30 percent. Searches increased almost 40 percent to more than 21 billion in 2011. Latin America leads the planet in search frequency, with an average of 173 searches per user. Mobile phones and tablets continue to account for a growing amount of digital traffic, with Puerto Rico at the top with 7.7 percent of all personal computer digital traffic. Apple led across nearly all markets in share of non-computer traffic, fueled by the iPhone and iPad. Alejandro Fosk of comScore said. "The rapid adoption of these behaviors presents a world of new opportunities to digital marketers. Thus, in order to capitalize on this burgeoning digital economy, it's important for brands and publishers to understand the key trends driving growth today so they can determine where to invest and how to position their offerings to the needs of the marketplace." Interested in how Consilium can help your business leverage amazing Latin American opportunities and with social media marketing localization?